Los Angeles is one of the most heavily populated cities in the United States. Between residents, commuters, and tourists, drivers log more than 45 million miles on Los Angeles roads and highways every day. It may not be surprising to learn that traffic accidents are incredibly common in the city. In fact, Los Angeles has been named the “deadliest city for traffic deaths” in the country. Statistics show that Los Angeles traffic accidents claim a life every 40 hours. Why do car accidents in Los Angeles happen so frequently? There are two primary reasons: infrastructure and driver negligence. First, the city’s roads are not in great shape. Broken and damaged infrastructure contribute to a significant percentage of traffic accidents every year. Second, drivers are engaging in dangerous and negligent behaviors behind the wheel. Los Angeles roads can only become safe if both of these issues are addressed. State and local government agencies and drivers share responsibility for making LA roads safer. Safe Roads USA is committed to doing our part to making roads safer throughout the United Sates. Car accidents have been happening more frequently on Los Angeles roads. In 2016, there were 44,207 reported car accidents in the city, an increase of more than 11 percent from the year before. Statistics reveal that accidents are also becoming more violent. Between 2015 and 2016, fatal crashes in the city increased by 7 percent. Infrastructure – including roads, bridges, and transit systems – are regularly evaluated by government agencies and private organizations. California regularly performs very poorly in these evaluations. Los Angeles roadways and infrastructure tend to contribute to the state’s poor rankings. The American Society of Civil Engineers (ASCE) regularly analyzes and evaluates roads, bridges, and infrastructure systems across the country. The organization publishes the results of its studies every four years. In 2017, California received a grade of “D” for the conditions and status of its roads and highways. Congestion, traffic delays, and collisions are increasingly caused by the state’s poor road conditions. Unsafe roads cost Californians $61 billion every year. California roads can only become safer if the state invests in repairs and improvements. The state needs to spend nearly $200 billion to improve the quality and safety of its roads. According to the ASCE, roads aren’t the only problem. Bridges across the state – including corridors on Highway 101 in Los Angeles – are in need of “major repair and rehabilitation.” In fact, no state has more bridges in “poor” condition than California. US News & World Report publishes annual reports that measure the “quality of state transportation infrastructure.” The report analyzes four distinct areas, including road quality, bridge quality, public transit usage, and commute time. In its most recent report, California ranked 41st out of 50 states. It received particularly low marks for road quality and commute time, two factors that contribute to a significant number of car accidents across the state. 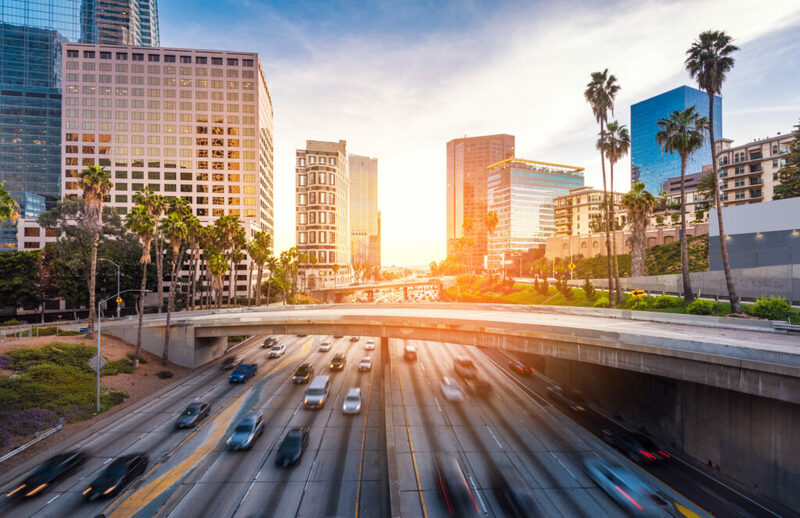 The report indicated that about half of all roads in California, including many in the congested Los Angeles region, were in “poor condition.” Poor conditions include potholes, missing signs, dangerous designs, uneven surfaces, and inadequate lighting. With roads in poor condition, it’s more important than ever for drivers to use care and caution behind the wheel. Unfortunately, many of the city’s accidents are caused by negligent and aggressive driving behaviors. Aggressive Driving: The fact that Los Angeles suffers from “crippling traffic congestion” often contributes to dangerous driving behaviors. Drivers become impatient and resort to behaviors that put themselves and others in harm’s way. This includes speeding, tailgating, making dangerous or illegal turns, and changing lanes rapidly without signaling. Drunk Driving: Alcohol-related accidents in Los Angeles increased by 7 percent between 2015 and 2016. Speeding: Speed-related accidents have become more problematic across Los Angeles. Between 2015 and 2016, the number of accidents involving speed as a contributing rose by 29 percent. Nighttime Driving: Drivers are more likely to be fatigued or under the influence when operating a motor vehicle at night. Statistics show that nighttime accidents increased by 15 percent between 2015 and 2016. Distracted Driving: Thanks to advances in technology, drivers are becoming more and more distracted behind the wheel. It’s not uncommon to see a driver focused on their smartphone rather than the traffic around them. Texting, checking social media, or talking on the phone prevents drivers from seeing traffic signals, identifying bicyclists and pedestrians, and maintaining their lane of traffic. The rise in accidents across Los Angeles can be attributed, in large part, to distracted driving practices. City lawmakers have realized that its roads and highways are becoming increasingly dangerous for commuters, bicyclists, and pedestrians. In recent years, the city has embraced many changes that are intended to combat poor road conditions and dangerous driving habits. Focus on education and traffic safety programs. Passing new legislation to deter dangerous driving behaviors. New laws would focus on enhancing the penalties for distracted driving, speeding, and other traffic violations. Collect and Utilize Data: Los Angeles roads can’t become safer until the city understands why its roads are so dangerous. City officials have expressed an interest in allocating funds to study traffic accidents and driving behaviors. The results of these studies can be used to improve road design and legislation. For more information on car accidents and traffic safety, or if you have injured in a car accident in Los Angeles, CA, then contact a personal injury lawyer at Citywide Law Group by visiting https://www.citywidelaw.com.